So. I might have a few self-control issues to address. This would explain why, after everything was winding down for the evening last night and I had settled down to review options for my desserts of the week for work, I found myself in the kitchen at 10:00 p.m., shaking powdered sugar out of kitchen towels. I honestly did not set out to make pumpkin roll. But the glossy pictures of roulades in the Martha Stewart Magazine were so … shiny … and tasty looking. After internally throwing around the idea of getting up in the morning to whip a few out before working on my calculus homework, I began doing some basic prep. It was already 8:30, too late to start mixing anything, so I would just mix together the dry ingredients, bring up the canned pumpkin from the pantry, bring in the cream cheese from the refrigerator and stop there. 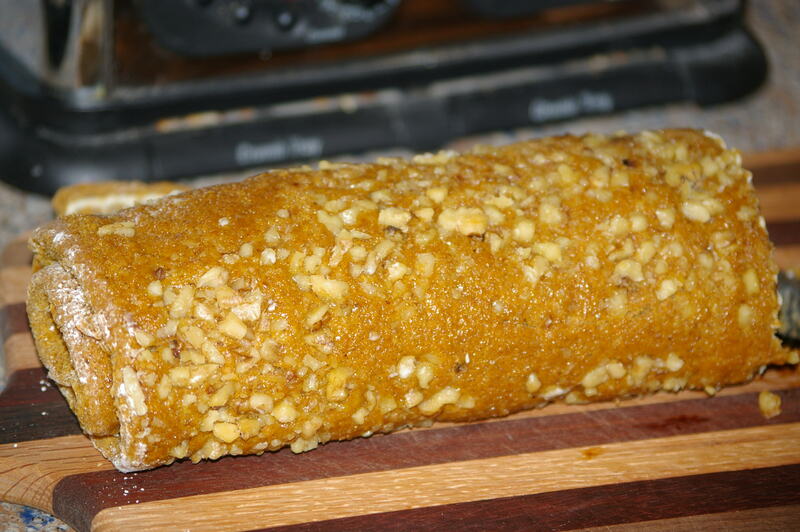 But after that, the spices smelled lovely, as spices generally do, double checking the baking time on the cake revealed that it would only take fifteen minutes and I could always roll the warm cakes, wrap them, and leave the filling for the morning. So it went, and I continued to rationalize away the time consumption until I ended up with this. Roulades, while delightful to make and view, have generally fallen flat flavor-wise for me. 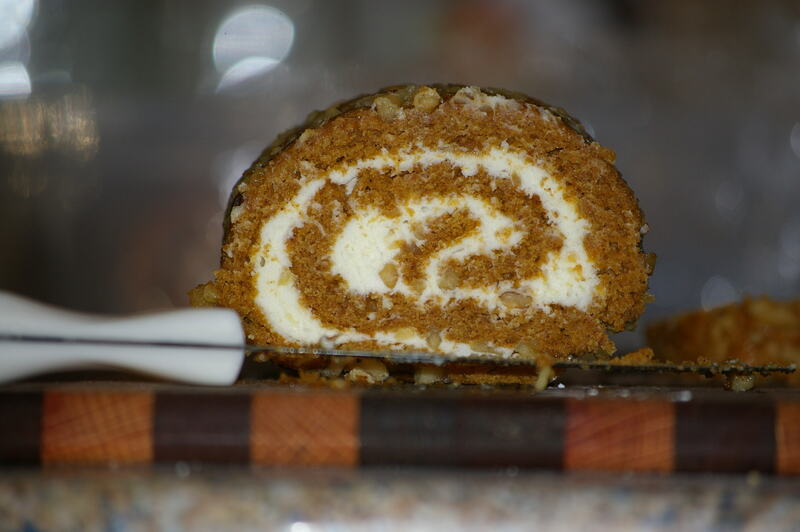 This recipe, however, using whole eggs, walnuts, and pumpkin wrapped around cream cheese, sugar, and butter, is as delightful as it is fattening. Left in the refrigerator or freezer overnight and the cream cheese sinks into the cake slightly, keeping it moist and sticky. The moistness of the cake also helps eliminate the cracking so common to this kind of cake, as most of the small fissures meld back together during the chilling period. 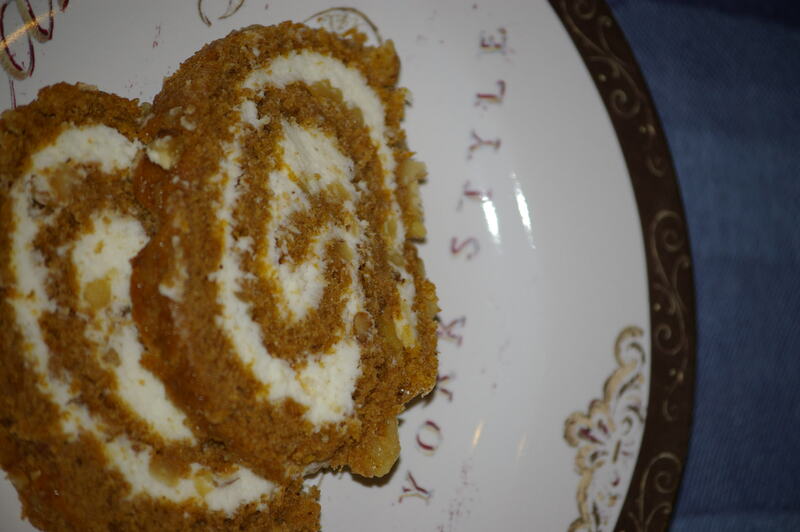 While the recipe itself is similar to one found on the Libby’s brand pumpkin, our recipe card, typed, yellowed, and handed down from my great-grandmother, makes it feel more special. And, now that I’ve timed myself and determined that it can be made, complete with kitchen clean-up and breaks to watch some of the more spectacularly silly scenes of ‘The Swan Princess’, in an hour-an-a-half, I think it’s safe to say that it’s also a fairly simple dessert, with impressive looking results.